Renovating homeowners should consider mahogany exterior doors Houston. Upgrading your doors is a small way to make a big impact. Rich wood like mahogany is perfect for projects like these. It helps your home stand out on its own or when combined with other materials. If you are looking to add some class to your entryway, you should think about this type of wood. There are some things you should keep in mind when considering mahogany. Learning more about the wood can help you avoid disreputable companies. Knowledge will also prevent you from buying low quality products. Cheap exterior wood doors will not last a long time. Care and ongoing maintenance are also important pieces of information. Mahogany, like all other wood, will warp if not well maintained. Once you have all this information, you are ready to start shopping. Interested consumers can call Southern Front to learn more. Southern Front Stained Glass and Doors has a wide selection of exterior and interior doors in Houston. You can view their catalogue online at http://www.southernfront.com. Those with more questions can call Southern Front at 291-890-5860. They are happy to help customers go home with the perfect doors. Both mahogany and fiberglass entry doors in Houston are popular choices. Each style has its own benefits and drawbacks. Fiberglass tends to be more expensive. It also does not look like the real thing. Some homeowners prefer wood because fiberglass looks and feels synthetic. If you want mahogany wood for its rich appearance, fiberglass will be a poor substitute. Mahogany is a very durable material, yet one that looks soft and bright. This type of wood is also ideal for keeping the elements out of your home. Homeowners who cannot choose between the two can find composite options. It is possible to find fiberglass styled to look like mahogany. You can also find doors where there is a combination of fiberglass and wooden elements. If you feel torn between the two options, consider blending both. Consumers that cannot find a style they love should think about buying custom models. This way you can tailor your entryway to your personal tastes. Southern Front has a large selection of mahogany and fiberglass doors. You can visit Southern Front Stained Glass and Door online at http://www.southernfront.com/. They have their catalogue posted online and available in their Houston location. Southern Front can ship to locations across the U.S. and Canada. If you want to give your entryway a face lift, contact Southern Front today. There are more than a few advantages to buying mahogany doors. These exterior and interior doors in Houston are thick, sturdy, and durable. Despite this, they do need ongoing care and maintenance to keep looking their best. You should clean your exterior doors often, to prevent scratches. Interior doors need cleaning less often. Most people recommend cleaning these doors once every six months, or as needed. Experts agree that you should avoid using harsh chemicals on any type of wood. Mahogany can tarnish or stain if you use the wrong chemical. To avoid any accidental damage, you can make your own cleanser. A solution made with two parts white vinegar for every one part of water will work well. Be sure you wipe off the door first, with a dry cloth. This will remove any excess dust or dirt from the door. Use a separate cloth to wash the wood. Be sure you move the cloth with the grain rather than against it. Remember to dry the wood after with a soft towel. 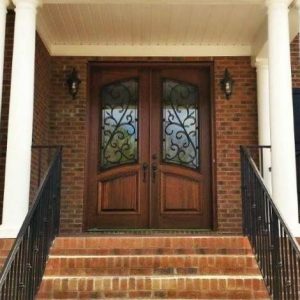 Homeowners interested in buying a mahogany door can call Southern Front. You can reach Southern Front Stained Glass and Doors by calling 291-890-5860. Interested customers can also visit them online at http://www.southernfront.com. Southern Front has a wide variety of mahogany doors for consumers to view. Contact them or visit them in store today to learn more. There is always a temptation to save as much money as possible when renovating. Some homeowners will buy cheap exterior wood doors, hoping to save a few dollars. Retailers who sell cheap doors tend to use inferior products as a way to keep costs down. As a result, you will wind up with a door that will not last. Cheap wood can rot and warp quite soon. It can also decrease your home’s value, and will need replacement more often. When shopping for a new door, take the time to research the supplier as well as the door itself. Look for a company that has a history of providing high quality products to their customers. Retailers with affiliations to homebuilder’s associations are ideal choices. Be sure you contact the company by phone or visit them in person before closing a transaction. Establishing personal contact will help you find the perfect company. You can start your search with Southern Front Stained Glass and Doors. They ship to customers across the U.S. and Canada, making them the perfect choice for everyone. Southern Front sells high quality, well made doors. Visit them online at http://www.southernfront.com to view their catalogue. You can also contact Southern Front by calling 291-890-5860. If you cannot find a style you like, ask about custom solutions. Learning more about mahogany can help you find the best exterior and interior doors in Houston. Your home deserves the charm and elegance a mahogany door will bring. This type of wood is very durable, making it perfect for families of all sizes. It is also easy to maintain and needs very little in the way of time-consuming care. Southern Front has a wide selection of beautiful mahogany doors available. You can see their selection in store or by visiting them at http://www.southernfront.com/. You can also contact Southern Front by calling 291-890-5860. Their staff members are happy to help you find the perfect door for your home. If you are looking for mahogany exterior doors Houston, visit Southern Front first.